A 2-hour walking tour along Hollywood's Walk of Fame! 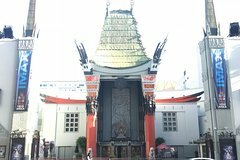 We start at the world's most famous intersection - Hollywood & Vine, and thereafter walk to Highland Avenue while seeing the iconic beauties of the Pantages Theater, Capitol Records, Grauman's Chinese and Egyptian Theaters, Dolby Theater, Roosevelt Hotel and the Hollywood sign! Walk LA’s most famous boulevard of Hollywood icons, stars, glitz and glamour! Hollywood Boulevard, the famed street where the golden age of Cinema started, and today’s film stars shine in movie premieres. See the buildings that grew the Hollywood film industry and learn how LA became to be known as the ‘City of Stars’. * Tour ends at Hollywood & Highland, which is 1.1 miles away from the starting point of Hollywood & Vine. From the ending point, Metro Rail is available to take you back to the starting point (rail fare not included).